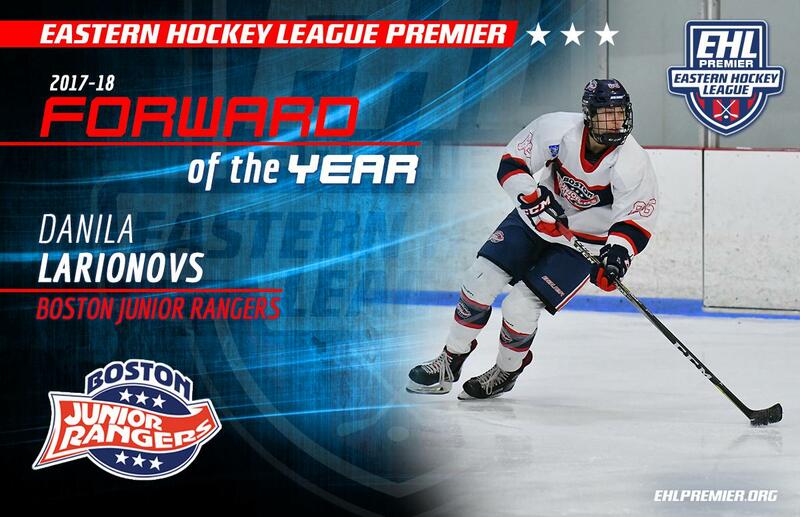 BOSTON, MA -- The Eastern Hockey League Premier (EHLP) is pleased to announce that Danila Larionovs of the Boston Jr. Rangers has been named the 2018 Forward of the Year (FOY). Larionovs finished the regular season with 61 points in 37 total games, and just notched a three-point night in his first career playoff game against the New England Wolves on Saturday. The Forward of the Year award and all other league honors, are voted on by the coaches in the EHLP. "Danila [Larry] Larionovs has been a pleasure to coach this season," said Rangers head coach Ryan Blair. "His commitment and will to get better was apparent on a daily basis. He's a real gamer; he's the type of player that wants the puck on his stick when the game is on the line. He did a great job accepting his role on our EHLP team as a 2000 and it has really paid dividends for his development. He has a bright future ahead of him." 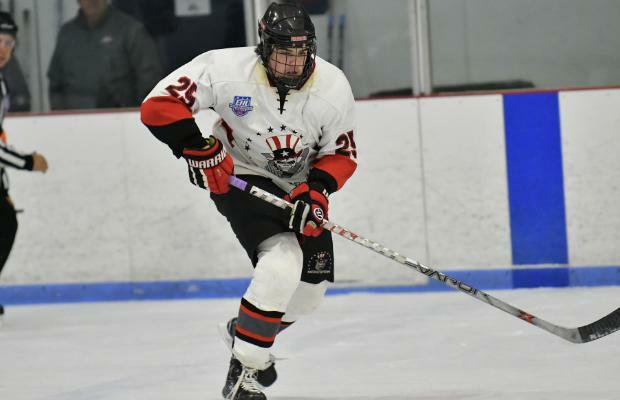 Larionovs has a few options for the next step in his junior hockey career, as one opportunity of course would be to move up to the Eastern Hockey League (EHL) level. Another option could come from the Shreveport Mudbugs, a team in the North American Hockey League (NAHL) that Larionovs skated with for a week this season. All in all, the 2000 born forward has developed well throughout his first season of junior hockey in the United States. "We are very proud of Larry," said Rangers' EHL head coach and general manager Rich DeCaprio. "He has the skill set, and more importantly, the character to become a very highly-touted player for NCAA hockey. His potential is unlimited. He has been a tremendous teammate and asset to our program." Following the Rangers win over the Wolves in the Second Round of the EHLP Playoffs, the team is now set to take on the Vermont Lumberjacks with a trip to EHLP Championship game at Providence College on the line. The 2nd place finisher for the FOY honor is Geordan Buffoline (Vermont Lumberjacks) and 3rd place is Jack Lane (New Jersey 87s). Tomorrow, the EHLP will announce the 2018 Defenseman of the Year (DOY).